Input text: The shiny circle is 65 feet above the ground. It is 2000 feet wide. It is 2000 feet deep. It has the [water] texture. The texture is 30 feet tall. The clear aqua pond is 3 feet above the shiny circle. The pond is 2000 feet wide. It is 2000 feet deep. It is 0.01 feet tall. The boat is -1.5 foot above the pond. The 5 cornflower blue lights are 12 foot behind the boat. 5 caribbean blue lights are 12 foot in front of the boat. 12 swimming pool blue lights are 10 feet left of the boat. 12 pond blue lights are 100 feet left of the boat. 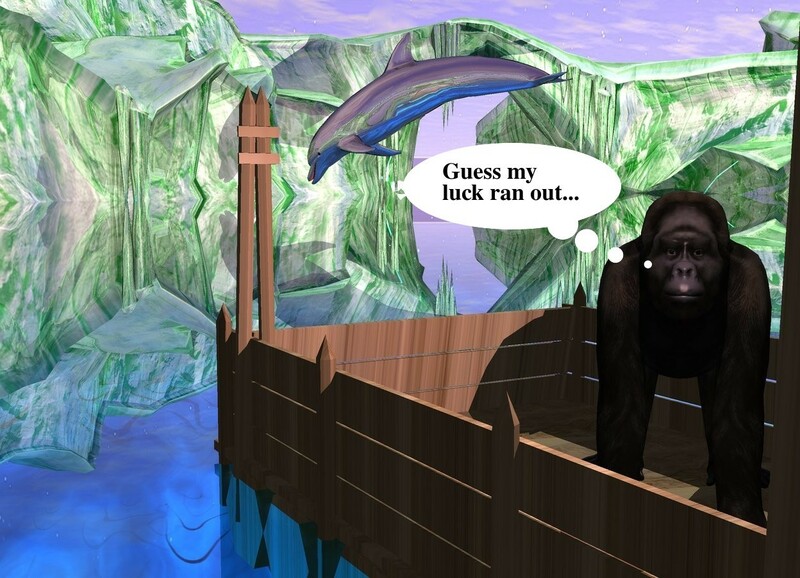 The gorilla is in the boat. The gorilla faces east. The pink light is 0.5 foot east of the gorilla. It is -0.5 foot above the gorilla. The camera light is black. The ground is shiny lime. The entire boat is wood. The boat faces southwest. The big shiny dolphin is -6 foot above the boat. It is 25 feet west of the boat. It is -3.5 feet south of the boat. It leans 45 degrees to the front.